The first step is to validate theÂ theoryÂ and theÂ algorithm and its configuration. 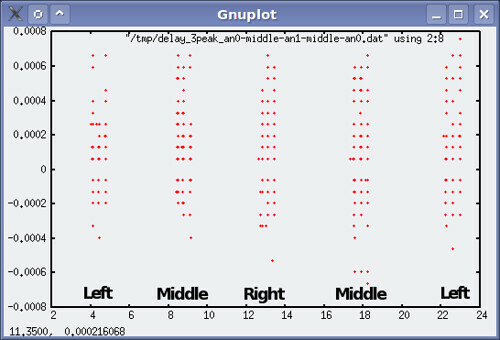 So first expected results is to determine ifwe’re able to know if the sound if coming from left, or right. In a second step, we’ll try to precisely know the angle. So, we first need to build two sound sensors. 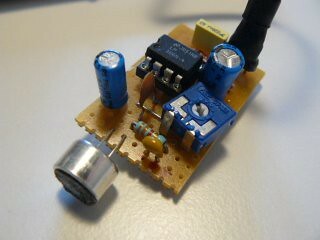 These are justÂ LM386 base pre-amp for electret microphone. Here’s a little picture. It has been deisgned to be as smaller as possible. I’ll later add the complete diagrams and build instruction directly within theÂ SirBot Project. The sound sensors are connected to theÂ mainboard, through a bread board. Not shown here, but during the experimentation, the mics are about 15cm distant from each other. Since we’re not going to measure angle, we don’t have to worry being inaccurate, what is important is this distance is greater than 2.75cm (see theory). The Jal program, as describe in part 2 (algorithm), will count the delay occurring when the sound will hit the first mic, then the second. It handlesÂ timeoutÂ if no sound could be detected with the second mic. Note there’s a delay occurring when data is available. 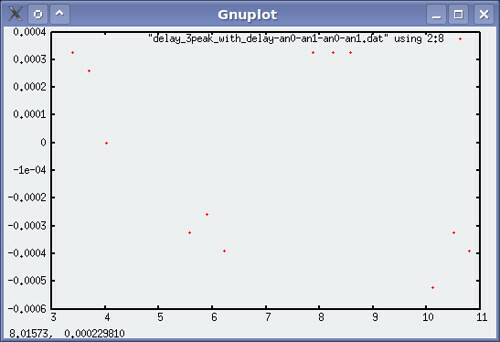 Without this delay (see first experiment), there’s too much data, inconsistent and useless. The program is availableÂ here. 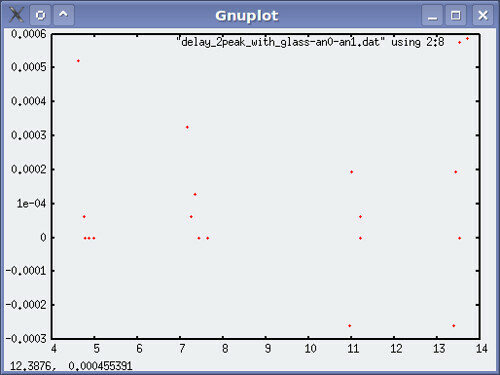 In this experiment, no delay is occurring when data is available (sound localized). 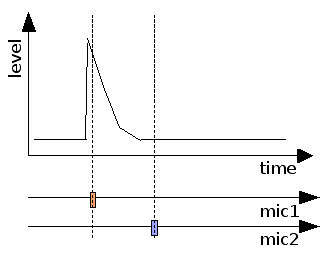 Plotting what the first and the second mic have received (shift with delay), this clearly shows all the expected peaks. 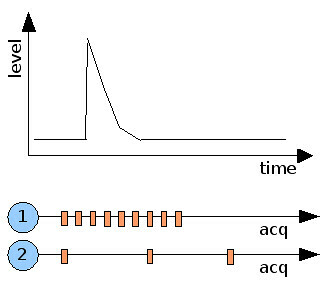 We clearly seeÂ the delay is alternatively positive (left) and negative (right)Â (point with delay = 0 is an artifact and should be ignored). Knocking near the mic has been done so theÂ sound wave is very narrowÂ (with plastic pieces). The delay is long enough so the next time we’re acquiring data, that’ll be for the next knock. Now, with the same delay, knocking a glass (sound is resonating) doesn’t give the same results… (knocking 2 times near the left mic, then 2 times near the right one). So… This costs me a *lot* of time, but results are interesting:Â if we’re waiting enough (but not too long) between data acquistions, we’re able to localize sound quite nicely… This delay is clearly important and depends on the type of sound waves we’re listening to. 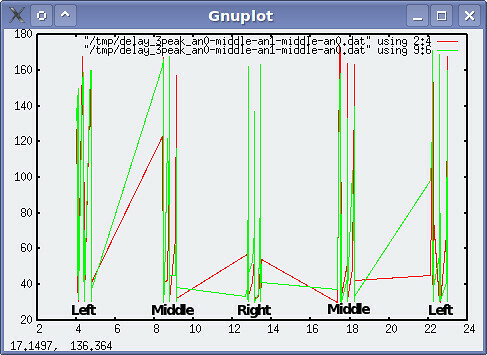 Next, I’ll try to determine where the sound comes from, computing the angle. the ADC itself. We’re using low resolution ADC (8 bits) but let’s compute it for high resolution (10 bits), so we’ll get a max value. With a 20MHz Xtal, it costs 1.6Âµs per bit, so 10 * 1.6Âµs = 16Âµs. There’s also a need to wait a little time (Tad time, see specs) after the acquisition. It costs 1Âµs. if a microphone didn’t detect any sound, we must switch the mics, and retry to step one. 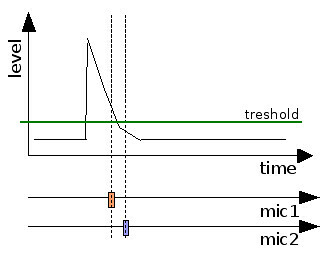 Measuring the delay occuring when the sound hits the first microphone, then the second, can be done usingÂ PIC timers. TheÂ PIC 16F88Â has several available timers. 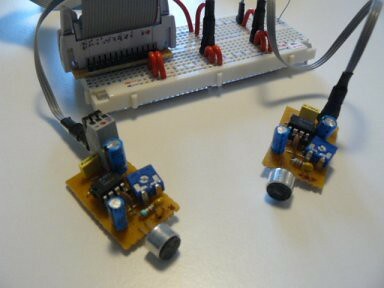 One interesting isÂ timer1, which is aÂ 16bits counter, the larger this PIC can offer. Using the internal clock as reference, the timer is incremented at Fosc/4 = 20MHz / 4 = 5MHz (every 2.10-7s = 0.2Âµs). Since it’s a 16bits timer, it can count 65536 * 0.2Âµs = 13107Âµs, which corresponds to ~ 4.5m. The wave’s width is large enough so acquisition can be done at least one time during the wave. The peak is too narrow, due to a too long acquisition time, we skip the information. theÂ acquisition timeÂ is an important factor the get reliable results. Must use a max-speed Xtal, that is 20MHz. theÂ distance between the microphonesÂ can’t be randomly chosen. It’s between 3cm and 450cm. 10 or 15cm is good. If too long, the sound level may be to low when hitting the second mic. there may be cases whereÂ information can be lost, due to theÂ wave formÂ (too narrow), to the fact weÂ can’t know which mic the sound will hit firstÂ (this increase the required acquisition time since we may need to get 3 acquisition to get a result). Note, a possible optimization would say: “there’s a high probability that when a sound hits micA, the next sound may also hit the micA. So if micA is the first, keep it as the first for the next sound dectection”.